For the configuration R1, the central 1 Ω resistor can be ignored since it is connected between equipotential points (similar to the galvanometer in a balanced Wheatstone bridge). The equivalent resistance connected across the battery is therefore 1 Ω. [2 Ω in parallel with 2 Ω]. The equivalent resistance in the configuration R3 is 2 Ω. Since power P = V2/R we have P2 > P1 > P3 [Option (c)]. Resistance of a metal increases with increase in temperature. If the unknown resistance X is decreased on increasing its temperature, the null point can be obtained at the sme point as before by decreasing the value of the standard resistance. You should note that nothing is mentioned about the nature of the unknown resistance. It can be a negative temperature coefficient (of resistance) device such as a thermistor. So, statement 1 is true. Metals have positive temperature coefficient of resistance. So, statement 2 is true. But it is not a correct explanation for statement-1. [If the unknown resistance is a metallic wire such as copper wire or nichrome wire, the resistance will increase on heating and the correct option will then be (D). The figure shows three identical blocks A, B and C (each of mass m) on a smooth horizontal surface. B and C which are initially at rest, are connectd by a spring of negligible mass and force constant K. The block A is initially moving with velocity ‘v’ along the line joining B and C and hence it collides with B elastically. At the moment the block A collides with the block B, you need consider these two blocks only. In one dimensional elastic collision between two bodies of the same mass, if one body is initially at rest, the moving body comes to rest and the body initially at rest moves with the velocity of the moving body. After the collision, the velocity of A is therefore zero. The above relations can be easily obtained from momentum and kinetic energy conservation equations. The block A has come to rest after colliding with block B. When the compression of the spring is maximum, both B and C are moving with the same velocity v/2 as shown above. Therefore, the kinetic energy of the system under this condition is 2×(1/2)m(v/2)2 = (1/4) mv2. [Note that the spring has negligible kinetic energy since its mass is negligible]. (½)mv2 = (1/4) mv2 + (1/2)Kx2 where x is the maximum compression of the spring. This gives (1/2)Kx2 = (1/4) mv2 from which x = √(mv2/2K). 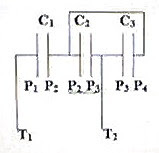 (1) An unusual type of capacitor is made using four identical plates P1, P2, P3 and P4, each of area A arranged in air with the same separation d as shown in the figure. A thin wire outside the system of plates connects the plates P2 and P4. Wires soldered to the plates P1 and P3 serve as terminals T1 and T2 of the system. What is the effective capacitance between the terminals T1 and T2? C = [(2ε0A/d) ×(ε0A/d)] / [(2ε0A/d) +(ε0A/d)]. 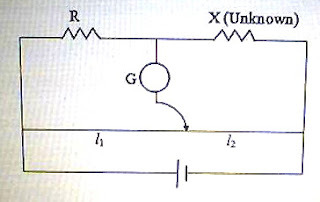 This is a very simple question once you identify the circuit to be a balanced Wheatstone’s bridge. The 3 μF capacitor is connected between equipotential points and you can ignore it. 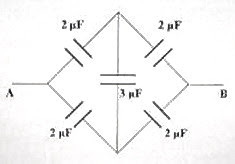 Without the diagonal branch, there are four 2 μF capacitors only. The capacitors in the upper pair are in series and produce a value of 1 μF. The capacitors in the lower pair also produce a value of 1 μF. Since they are in parallel the effective capacitance between the points A and B is 2 μF.